Fisherman’s Friends – http://www.fishermansfriend.com – made in Fleetwood, Lancashire, England. 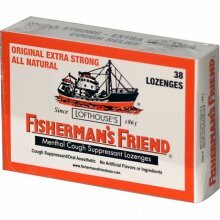 Wholesale but widely available. .
Lofthouse’s Fisherman’s Friend 45g. Made in England. This entry was posted in Confectionary, Medicines / Medical, Sweets and tagged Fisherman's Friend, Fisherman's Friends, Lofthouse, Made in England on March 18, 2013 by ukmade.